Take your skating levels to a new horizon. 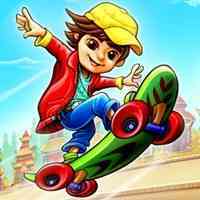 Dennis the freestyle street skater with his epic Skateboard is all set to accompany you in the fascinating skating world. Make this Kid reach the extreme skyline. Explore a whole new world with captivating maps, skate ramps, challenges, heel flips, jumps and adventures. Collect coins to upgrade your packs and make your skating journey more entertaining.